“Please check on James* in room 24,” the nurse said when I arrived on the unit. “He’s been anxious all day and we’ve got him with a 1:1 nurse. Katie’s with him now.” James was in his late 80s with dementia. He had come to our inpatient hospice the day before for symptom management after his increasing restlessness led to him falling repeatedly at his assisted living facility. James was fidgeting in his wheelchair with his head drooped down and his brow furrowed. As I sat down and got out my guitar, I watched Katie cue him to stay seated. He picked up his head and nodded when I asked questions to determine the music he liked – big band and jazz. I started with an upbeat song that matched his restless state then gradually slowed down the tempo as I moved to other songs. When he tried to stand, we’d remind him to sit and listen to the music. As I continued to play, he began to rock gently back and forth to the beat for short stretches and his face relaxed. Katie slipped away to attend IDT. After several minutes, James closed his eyes and rested back in his wheelchair for a minute. I paused my singing to see if he was ready to rest, but he began fidgeting with the arms of his wheelchair again. I started another string of songs, beginning with a slow ballad from the 40s, and he sat back again and gradually dozed off. Katie returned and James opened his eyes. “James, are you ready to take a nap?” she asked. He nodded and calmly let her help him into his bed. 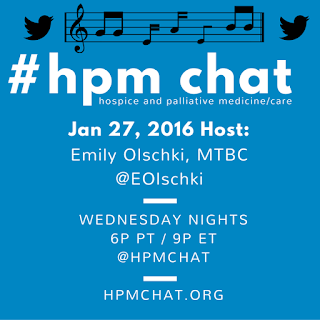 Join us for the #hpm chat on Wednesday, January 27 at 9 pm EST to discuss music therapy in hospice and palliative care settings. T1. What have your experiences been with music therapists in your health care org? T2. What do you see as the barriers to accessing MT in health care settings? How do we overcome? T3. Qualitative research in MT has shown that MT can increase self-expression (Gordon and Clements-Cortes, 2013), family bonding (Savage and Taylor, 2013), and QOL (Hilliard, 2003). What future research would help MT implementation in more #hpm programs? Emily Olschki, MA, MT-BC (@EOlschki) is a board-certified music therapist working with adult and pediatric patients at Kansas City Hospice and Palliative Care. *Names, ages and details changed to protect patient privacy. Gordon, M., Clements-Cortes, A. (2013). 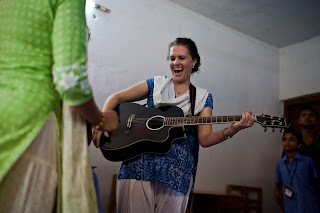 Music at the end of life: bringing comfort and saying goodbye through song and story. Annals of Long-Term Care: Clinical Care and Aging, 21(11), 24-29. How Long Does Granny Have, Doctor?